Australian players came to the fore for the first time in the 2012 WSOP with Julian Powell and Australian Poker Hall of Famer Marsha Waggoner running deep in their respective events. Powell lost his semi-final match to eventual champion Leif Force (pictured left) in Event #3, the $3000 Heads-Up No Limit Hold’em/Pot-Limit Omaha tournament. 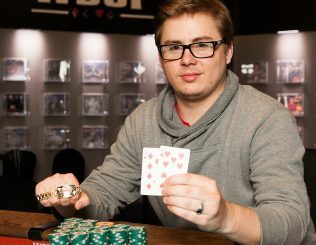 Force collected USD $207,708 in prize money and his first WSOP gold bracelet. 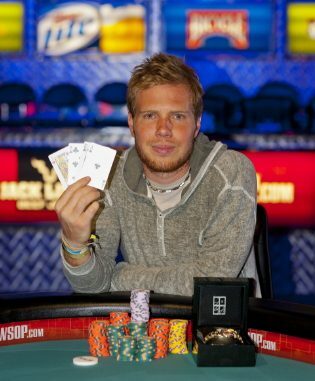 Prior to this victory, Force was best known for his 11th-place finish in the largest live poker tournament in history, the 2006 WSOP Main Event Championship, for which he earned USD $1.1 million. Powell was listed in equal third with Simeon Naydenov, earning USD $73,655. The young Aussie survived a marathon quarter-final match against Gregg Merkow to win through to the final four. Corey Zeidman, from Syosset, New York, won Event #4, the $1500 Seven-Card Stud High-Low Split tournament. Zeidman, a 51-year-old sports marketing executive collected USD $201,559 in prize money. He was also presented with his first WSOP gold bracelet. Zeidman finished sixth in this same event last year. US-based Aussie Marsha Waggoner added another cash to her decorated WSOP resume in placing ninth for USD $12,822 while another ex-pat Aussie, David Steicke, finished 26th for USD $4567. 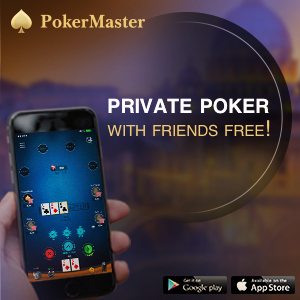 • The WSOP is one of the few tournaments that allows for the possibility of participants to play in two events at the same time. In years past, many players have done so but cashing in two events simultaneously – where all three playing days are in conflict – is unprecedented. Mike Sexton, a former gold bracelet winner and inductee into the Poker Hall of Fame two years ago, entered Event #3 and Event #4, which began the same day. In fact, the two tournaments were very much at odds, since the overlap included three consecutive days. Even though the Heads-Up format of Event #3 (which included mandatory down time) allowed Sexton more time to concentrate on the Eight-or-Better competition, he nonetheless entered the record books. Sexton accomplished what is believed to be a first in poker history. He entered both tournaments, and not only cashed in both but also managed to finish in the top 16 for both tournaments. Two min-cashes would have been quite impressive but to think that Sexton ran deep in two overlapping events is phenomenal. Furthermore, Sexton has proven once again that he’s among the very best Seven-Card Stud High-Low Split players. This was his 11th cash in this event since 1985, which is a phenomenal feat. In fact, he finished as the runner up in 2011, and then ended up as the 15th-place finisher this year. Sexton also won this event – back in 1989. • In other bracelet events, the $1500 buy-in Pot Limit Hold’em tournament (Event #5), played from 77 way down to nine survivors. 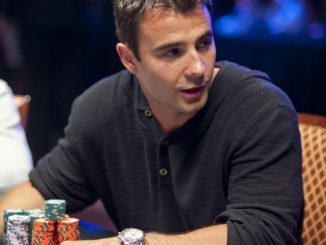 Bryan Pellegrino leads the pack, ahead by more than 2 to 1 in chips over all but one player. Daniel Negreanu is sixth in chips heading into the final table. Event #6, the No Limit Hold’em Mixed Max made its WSOP debut following a highly-successful showing at 2011 WSOP Europe, held in Cannes, France. Day One was played nine-handed, day two will be played six-handed before heads-up play among the top 32 to decide the title. Players in this event will be chasing a slice of the USD $1,922,300 prizepool. Event #7, a $1500 Seven-card Stud tournament also kicked-off with the field of 367 starters reduced to 110. The other event starting today is the $1500 Omaha High-Low Split (Event #8).